Learn more about cooking and eating locally at Kristin’s blog The Intentional Minimalist. Separate twelve egg whites to a large glass mixing bowl. Thinly slice one half cup red onion into rings, separate rings and chop rings in half. Thinly slice one half cup fingerling potatoes. Remove one quarter cup flat leaf parsley from stems. Thinly slice one half cup of cooked white brat. Warm one tablespoons olive oil in a large metal skillet over medium heat. Lay the potato slices on the bottom of the skillet and cook for one minute, flip potato slices over, cook for one more minute then remove potato slices from skillet. Add an additional tablespoon of olive oil to the skillet, one third of the red onion slices and cook for two minutes. Gently pour in egg whites and cook on on medium heat uncovered for three minutes until the eggs begin to set. Layer on one third of the red onion slices, one half of the potatoes, one half the of the sliced brat, one half of the parsley, one tablespoon liptauer cheese and cook uncovered in the oven for five minutes. 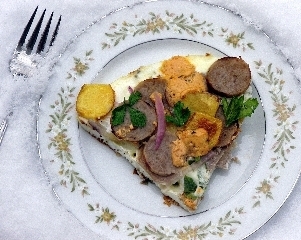 Remove frittata from oven and layer on the remaining red onion slices, potatoes, sliced brat, parsley, one tablespoon liptauer cheese and cook uncovered in the over for an additional five minutes. Remove frittata from oven and let rest for five minutes before serving.